Our own fears, acquired beliefs and limited self concepts can block us from the most amazing potential and miraculous life that is calling to our hearts. Ancestral imprinting is carried forward into our own lives even if it not longer has relevance. The fear is there to hold us tight and keep us small. It is our glass ceiling. We all know how to sabotage subconsciously and to get in our own way of breaking through the glass ceiling. We remind ourselves how much safer it is to cuddle under a fuzzy blanket than to open our vulnerable hearts to the world. However, angels remind us that he sky is wide open when we align with our soul purpose…. and the sky is safer when we fly. From the bottom of my heart, I want to thank you all deeply for your unwavering support. The past two years have opened up a deeper understanding to the feelings generated by support and by hostility. These are primal archetypes that live in the human collective psyche. The fear of betrayal has been deeply ingrained in our generational state of being. Even though it may not be real in the present, the deep sense can so easily be triggered by present circumstances. The mind goes: “Oh THAT is not safe!”. We know what types of agendas take place in the earth realm, and we hide our light to avoid the danger of shining. If you are sensitive and empathetic you will have an understanding based on the generations of mistreatment that have lead up to our modern lives. Things that shine sometimes attract shadows. Something in our soul memory perpetuates the awful feeling of being hated, as if an ancestor or loved one from a lifetime ago was burned at the stake, or ostracized for stepping forward into a rigid social milieu with their personal truth. This memory is deeply imprinted in our collective psyche, and has kept people silent and afraid for many generations. Geeeesh and oh my… oh my, I felt it very personally. What if that paradigm is ending? We are all being supported by the universe, and by each other, to reclaim our voice. We may have allowed our old collective programing to wake us up way too many times in the middle of the night. Yup, that was me. Yet, the new programs have taken root. They are growing stronger every day, bringing support, care, and trust. Thank you , dear God! It is time for us to feel safe in bringing light to others. Miracles happen when we keep up and align with our purpose at this time of serving humanity. The time has come to take stock of and celebrate those miracles. The new age is about giving and helping the world. And when we do so we experience fulfillment far beyond the old paradigm that congratulated those with power, wealth or status. We are now in the age of Aquarius. Fulfillment today comes from genuine alignment of the inner core of our beings. The inner truth of you, with the outer expression of you! In my life I have been witnessing these miracles, and I so love it. They are not the motivation. Trust is. They are the result of staying simple, surrendering to the infinite, and trusting that one’s inner grace is divine. As a teenager I was attracted to the bright smiles and beauty of the models on the cover of mainstream magazines. Weren’t we all? The beauty was compelling. As I grew and moved on to teaching I began seeing that beauty in others as a gift to humanity. Sometimes my ego would creep in, but my practice (sometimes a looooong practice) would bring me back to my heart, again and again. Sometimes I felt so invisible, and knew it was because I myself was hiding in my glass box with shutters all around. How profound it is to shake and shift and then see myself on the cover of a national magazine. Here I am on the cover of Yoga Journal’s September issue. It feels like an absolute miracle. This is the kind of miracle that is possible when we align our inner calling with our outer work. Maybe it is also about letting go of the need to be anything other than love. I do not know, and do any of us truly know? What I do know is that…. 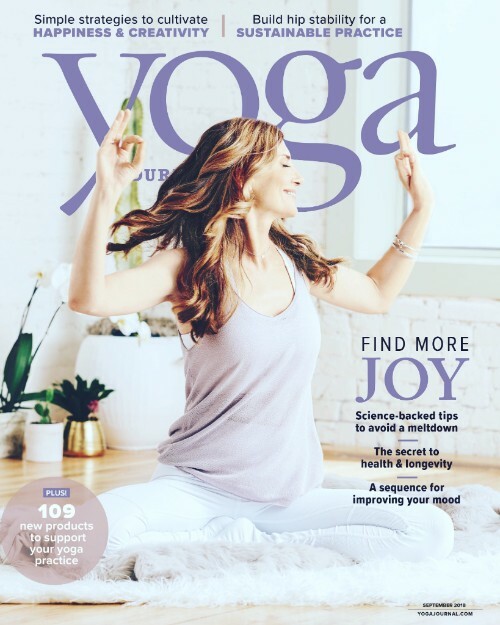 I am so grateful to everyone at Yoga Journal that were part of this miracle, but more so I am grateful for this sweet infinite presence that has guided my heart to share these techniques that can really help people. I mean really help! 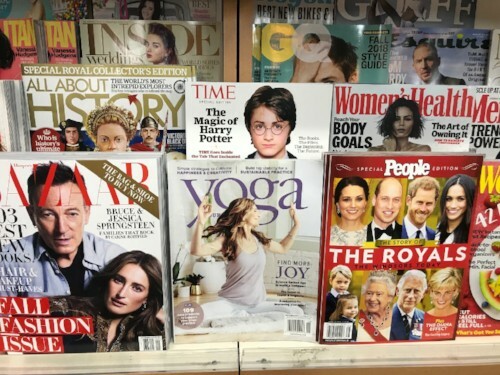 I love this photo, doing a Kundalini yoga spinal twist in between Bruce Springsteen on one side and The Royals on the other. Hi, Bruce. Hi, Buckingham palace. How did I get here? Maybe I leaped when I felt angels asking me to jump? Maybe it was time to get out of my own way? Maybe that is part ego, maybe it is soul? Either way, it is full miracle. The self serving way is the Piscean way. It may have worked for centuries. But it will not fulfill us any more. Society taught competition to be more powerful than others as the force behind success. Our attitudes have been honed with deep grooves over the years of our predecessors. It still “works” in the old sense. But it is no longer aligned. It is no longer will provide fulfillment. Now it looks ugly. It hurts the soul and it creates a negative vibration in our psyche and energy field. If someone is sensitive it will lead to shame and self doubt. If they are insensitive it will lead to isolation and depression. What I firmly believe in is opening my heart and sharing with the intention of helping others. I have been teaching weekly yoga classes near my home for decades, and teaching on retreats further from home for week after week, year after year. More recently online. But there are only two motivations. One is I love to help others, and these techniques I have been privileged to learn can really help. And secondly, it is for my own fulfillment on my own journey. I just know it is the right for me do do. It is my fulfillment. It lifts me up each time I share with the intention of lifting others. I never did it for fame. My old career as an actress would have been my road to fame if that was my drive. At the same time, it was challenging to me to keep myself small when my flower wanted to blossom. These ancient techniques have profound effects on our modern lives. The veil between heaven and earth is thinning more and more daily. Can you feel it? Are you afraid to jump? I would love to have you join me for a special event. Can you join me in California to go deeper? Maybe join me online (more on that soon), or find these practices through my book, Essential Kundalini Yoga? Or, maybe, hold tight to my heart and know how very loved you are, AND trust that angels are with you always. You hold a space in my heart if you are reading this. I know this because if you didn’t you would have unsubscribed from my disruptive but FIERCE Love.